Cinder blocks are often used in the foundation of a home or as the exterior wall of a building used for business or industrial purposes because they are durable and economical. One drawback to cinder block walls, however, is that they leave a rough, unfinished appearance. 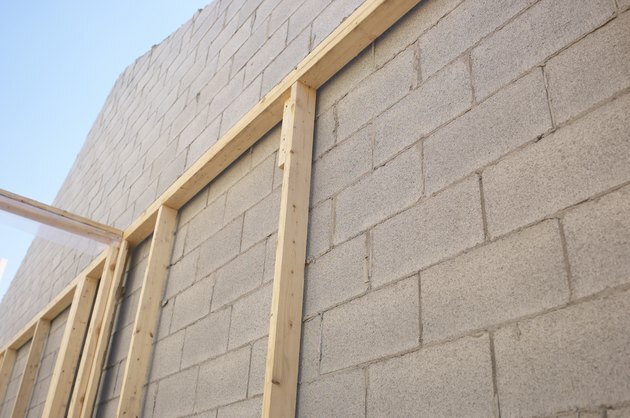 This may work in a warehouse setting, but for a more finished appearance in a house or office, cover the cinder blocks by building interior walls. 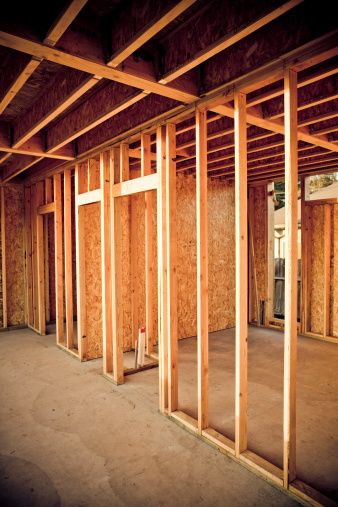 Framing out interior walls over cinder blocks can hide them. Cut pressure-treated 2-by-4 boards to fit along the base of the wall. These are called sill plates and are used to connect the wall frame to the floor. Drill pilot holes into the floor every 12 inches where you are installing a sill plate. Use a standard drill bit for wood floors and a masonry drill bit for concrete floors. Place the sill plates into position along the base of the cinder block walls and attach them to the floor. Use galvanized screws for standard wood floors and masonry screws for concrete floors. Cut standard 2-by-4 boards to fit on top of the sill plates. Cut two boards for each sill plate. These boards will be the top and bottom plates for the wall frames. Lay a top and bottom plate on top of a sill plate. Measure the distance between the 2-by-4s and the ceiling to determine the height of the wall studs. Cut 2-by-4 boards to be the wall studs. Cut enough boards to install studs no more than 16 inches apart. Nail a stud into each end of one of the bottom plates. Nail studs between those two end studs, keeping the studs no farther than 16 inches apart. Nail the top plate to the top of the studs. Construct the other wall frames, following the same method used to construct the first frame. Lift the first wall frame into position on top of the first sill plate. Check it for plumb (vertically straight) and level (horizontally straight) and nail the bottom plate to the sill plate and the top plate to the ceiling. Install the other wall frames using the same method and nail the end studs of adjoining frames to each other for added strength. Measure and cut rolls of fiberglass insulation to fit the spaces inside the wall studs. Place the insulation against the wall inside the studs and staple the paper on the back of the insulation to the inside edge of the studs. Measure and cut sheets of drywall that are 1/4 inch shorter than the wall. Hold the first drywall sheet against the ceiling and the adjoining wall in the corner. Have an assistant help you with this. Drive drywall screws through the drywall and into the wall frame. Begin in the center of the sheet and work toward the perimeter, using one screw every 16 inches. Install the rest of the sheets using this technique. Apply joint compound to all the joints between the adjoining sheets with a putty knife. Place drywall tape over the joints and press it into the joint compound with the putty knife. Allow it to dry overnight. Apply two more layers of joint compound and drywall tape to the joints, allowing each application to dry overnight. Apply a coat of primer to the walls and allow it to dry. Paint the walls with the paint color of your choice. Apply two coats of paint, allowing the first coat to dry before applying the second coat.